I went to Program Files, found Android directory, but none of those works. Upon research, I found out that Android developers have warned me to take note of the SDK directory, which I didn't. That exe that you guys wanted me to look for is indeed inside platform-tools. 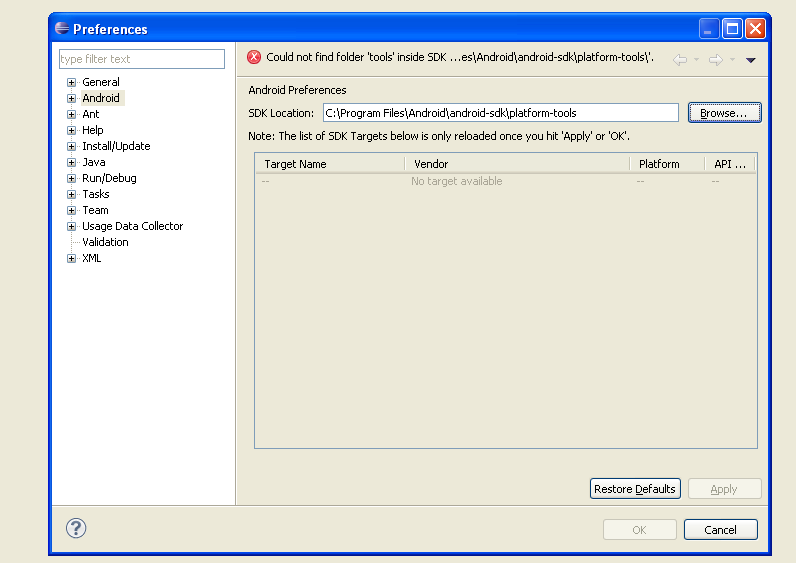 I installed Android SDK, and it gives me Android SDK Manager. So I am guessing I had the right thing installed on my PC. You can search your hard drive for one of the programs that's installed with the SDK. For instance, if you search for aapt.exe or adb.exe, they will be in the platform-tools directory underneath the installation directory (which is what you're after). This can be used in Eclipse after you replace USERNAME with your Windows user name. This is the default location for Windows 64-bit. Also, try to recall some of your default locations when not presented with some suggestions. There's no such "SDK installation"... may be, what you installed was the ADT plugin (which does not include the SDK). You have to download one of the ZIP files you find in the link above, uncompress it and boila! you have the SDK Folder. You should immediately switch to use Android Studio, the official IDE for Android. For help transitioning your projects, read Migrate to Android Studio.